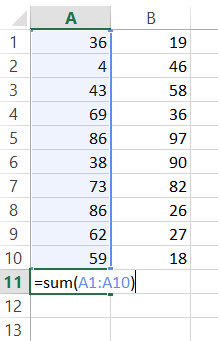 We will use the Sum Function to add up entire rows and columns. Tip 1: The Shortcut ALT + = (press and hold ALT then tap =) will automatically create a Sum Function. 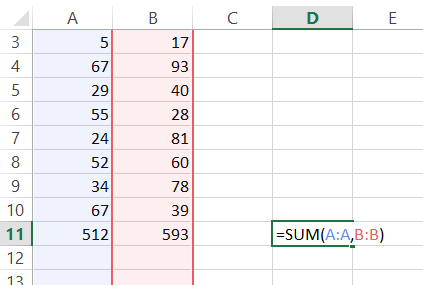 When possible, Excel will guess which cells you would like to sum together, populating the Sum Function. Tip 2: After using the ALT + = shortcut or after typing =sum(, use the arrow keys to select the appropriate cell. Then hold down SHIFT or CTRL + SHIFT to select the desired range of cells. Tip 3: Instead of using the keyboard, you can also use the mouse to drag and highlight the desired range and complete the formula. 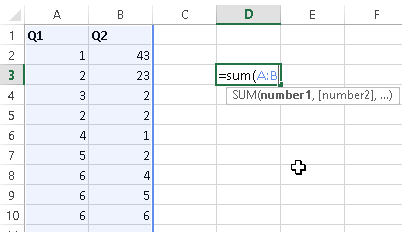 To add up an entire column, enter the Sum Function: =sum( and then select the desired column either by clicking the column letter at the top of the screen or by using the arrow keys to navigate to the column and using the CTRL + SPACE shortcut to select the entire column. The formula will be in the form of =sum(A:A). 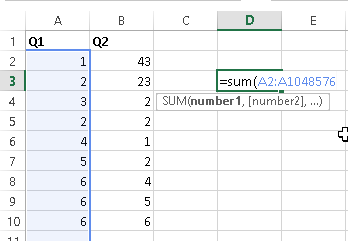 To sum columns or rows at the same time, use a formula of the form: =sum(A:B) or =sum(1:2). Remember that you can also use the keyboard shortcuts CTRL + SPACE to select an entire column or SHIFT + SPACE an entire row. Then, while holding down SHIFT, use the arrow keys to select multiple rows. 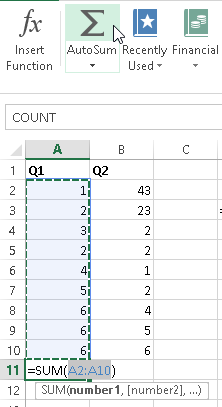 There are several ways to add up non-contiguous rows or columns at once. Of course, you can create multiple Sum Formulas and add the results together. However, you can also use a comma delimiter within the Sum Function to enter multiple arrays of numbers within the same Sum Function. Often times, you need to add up an entire column (or row), except the header. 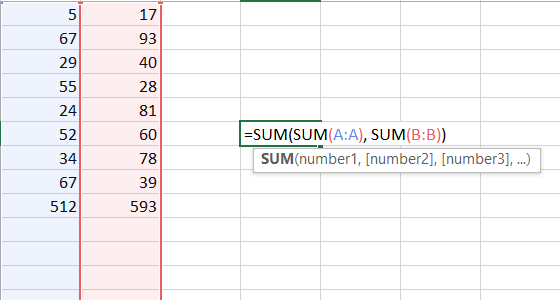 In Excel 2013, non-integer entries included in the Sum formula are automatically ignored. If you included cell A1 (the header) in the Sum Function: =sum(A:A), the Sum Function would work properly. However, it is good practice to maintain backward compatibility. Instead, you can use formula =SUM(A2:A1048576). Why 1,048,576? Excel worksheets only have 1,048,576 rows! To see this, select a cell in a blank column. Then you use the shortcut: CTRL + Down Arrow to navigate to the last row in the worksheet. Select a cell above/below or left/right the range you want to sum. Then use the shortcut ALT + = or select the Formulas Ribbon > Autosum. Doing so will automatically generate a formula for you!